The European Union has formed an alliance with 79 African, Caribbean and Pacific countries in a final push for agreement at the climate summit COP21. The new alliance has agreed a common position on some of the most divisive aspects of the proposed deal. They say the Paris agreement must be legally binding, inclusive and fair - and be reviewed every 5 years. The EU will pay 475 million euros to support climate action in the partner countries up to 2020. 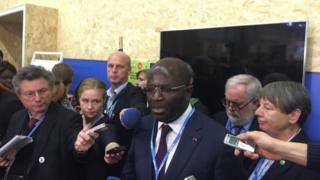 The alliance has also agreed that the Paris text must include a "transparency and accountability system" to track nations' progress on their climate pledges, and share best practice. The talks here at Le Bourget have shown signs of progress since a draft text of the deal was agreed by all parties here last Saturday. This announcement from the EU is likely to boost the chances of a deal. "It is extremely important that at this stage of the negotiations 79 countries from Africa, the Caribbean and the Pacific and 28 European countries join forces fighting for a very ambitious agreement in this climate summit," said EU climate commissioner Miguel Arias Canete. "We consider it extremely important to have this joint position. We were united in Durban (2011); we are united now." Negotiators have been struggling to find agreement on a long-term goal for the Paris agreement, with small island nations in particular pushing for a deal that would seek to limit warming to 1.5C. "We are working to find the language to accommodate 1.5 degrees within the agreement," Mr Canete said. "We are still talking on it." The 475 million euros will be to support climate action, resilience-building and the environment in African, Caribbean and Pacific countries. This seems to have been key in getting the support of these nations for a review process every five years. "We believe this agreement must be something very tangible with clear-cut targets, and that it be reviewed and examined every five years," said Dr Patrick Ignatius Gomes, the chairman of the African-Caribbean Pacific group of states. The alliance came as other ministers and observers talked up the chances of a deal. "Though we have some tough issues in the next few days to resolve, I am confident that we have the ability to do it," said US Secretary of State John Kerry at the meeting. There are still significant divisions on finance and on the roles that the developed and developing nations must play. But there is a growing sense that ministers are engaged. "We are advancing on everything," said France's climate ambassador Laurence Tubiana. "There is no issue where we are blocked," she added. "None."